It’s an exciting time to be a genetic genealogist. 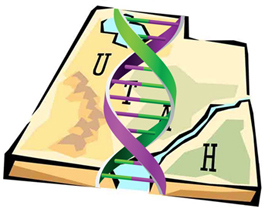 The DNA world continues to develop and evolve and nowhere was that more evident than in Salt Lake City this past week as announcement after announcement came from the major players in the genetic genealogy community. The venue was the massive combined conference of the Federation of Genealogical Societies and RootsTech, and what was announced shows just how much DNA has moved into the genealogical mainstream in just a few short years. Big news from AncestryDNA and Family Tree DNA dominated the landscape… but even 23andMe dropped hints of good things to come. First out of the gate was AncestryDNA with its announcements that, first, it will begin selling testing kits in Australia and Canada this year after its successful launch in the United Kingdom and, second, it will expand on DNA circles by a system of tree matching using DNA — even if you don’t have a tree. Kendall Hulet, Ancestry vice president for product development in charge of AncestryDNA, and his AncestryDNA team demonstrated the DNA Circles expansion to a group of DNA bloggers during the week, and explained that the aim of the new system will be to connect an individual who has DNA-tested to others likely descended from the same ancestors — even if the individual’s tree doesn’t show the connection. The current DNA Circles system takes persons who do share DNA and combines them into groups based on data from their public Ancestry family trees. If I match you and you match me and we both have — say — John Smith as a direct ancestor in our online trees, we show up on AncestryDNA with a shared ancestor hint. DNA Circles then takes our group and matches it to other groups that also have John Smith in their trees but who may match only me or only you. It’s a way to build out groups of cousins who can work together to try to determine if we really do all descend from the same John Smith. The expanded DNA Circles will take the DNA testing data alone and suggest groups that an individual could belong to, even if that individual has an incomplete tree online — or no tree at all. The intent is to group people where there is enough common DNA to say that it is likely that everyone in that circle is related through a particular ancestor or ancestral couple. Hulet and Ancestry DNA Senior Product Manager Kenny Freestone added that there was, of course, no guarantee that the suggested relationship would be correct; it was — like the shaky leaf hints and shared ancestor hints — a research suggestion instead. And, they noted, only about two in seven AncestryDNA users will see a new suggested circle pop up: in the demonstration, for example, there were no new suggested ancestors in my lines. The rollout of the new Circle system won’t be for some weeks yet and it will come at the same time as a new visual presentation for all Ancestry data that will include biographical information on these new suggested ancestral links. Next up was the announcement by Annelies Van Den Belt, Chief Executive Officer of DC Thomson Family History, of a partnership between its service Findmypast and Family Tree DNA. The exact details of the partnership will be fleshed out in the weeks and months to come, but starting immediately, Findmypast will be offering a special rate on Family Tree DNA tests as part of their premium service for annual subscribers, Findmypast First. Particularly in light of Findmypast’s European roots and strong English-Irish-Scottish-Welsh presence, this partnership may pay off strongly for Americans who’ve tested with Family Tree DNA and are looking for their British Isles roots. Last but hardly least of the announcements was the announcement by Family Tree DNA yesterday that it has partnered with FamilySearch to provide direct links from Family Tree DNA to the FamilySearch Family Tree — and from that tree back to Family Tree DNA. James Brewster of Family Tree DNA demonstrated the coming-soon linking yesterday in a presentation to the Federation of Genealogical Societies, “Five Fun New Ways to Improve Your Genealogical Research.” And it looks like it’s going to be terrific once it launches. Anyone logged in to FamilySearch who drops down the Search menu will soon see a new menu choice: DNA. Clicking on that will present a user with the chance to search the database to see how many people with a particular surname have done a DNA test and how many people are in the family tree of a person who has done a DNA test. For example, a search result could report that there were 1045 people with that surname in the Family Tree DNA database, that the surname appears in 14 countries, that 245 DNA projects are researching that surname and that there are 13,218 people with that surname in the family trees of people in the Family Tree DNA database. And every search report page will offer a link that allows the user to order a DNA test right then and there. Anyone logged in at Family Tree DNA will be able to click on a link and connect testing data from Family Tree DNA to the FamilySearch Family Tree database. Anyone looking at matches at Family Tree DNA will see a new icon showing that a match has a family tree at FamilySearch — with direct links to individual entries at the FamilySearch Family Tree that match. Users of the FamilySearch Family Tree will be able to link their Family Tree data with their Family Tree DNA test results and entries for individuals in the FamilySearch Family Tree will have links to relevant testing projects at Family Tree DNA. Users of Family Tree DNA will also be able to link their data to trees at Geni.com and MyHeritage. It’s clear from discussions with executives of all of the DNA testing companies that there’s more to come and soon. Family Tree DNA will have new groups and a global search capability. AncestryDNA will have a visual presentation of data that makes seeing connections easy. Even 23andMe — which had no announcements during the conference — made it clear that there are good things just around the corner. Did FamilySearch or FTDNA provide any details on how they will work with living persons? A large portion of DNA tests have been done for people who are still living, however FamilySearch Family Tree does not publicly display living persons. Will DNA test data of living persons need to be phased in order to work with FamilySearch Family Tree? No details on that as far as I’m aware, but I’m sure we’ll be getting more information as the launch gets closer. It will be interesting to see how this interconnectivity is going to work and what safe guards are going to be put into place or how many people will have to take pruning shears to the branches in their tree. At present, Ancestry has a private tree of mine with 1800 people. In the new DNA match system, of the five Smiths in my tree, everyone who has a Smith shows as a possible relative, with consideration to context. I believe Ancestry and everyone else has to look at other factors such as ethnicity, Dates of Birth and where that birth was, to make this work. I have 200 plus pages of 4th through 8th cousins, some of whom make sense, but many who do not. As I look through Ancestry DNA, or the other two US contenders, I do not want 18,000 Smiths’ as potential relatives when only an extremely few would actually have any potential. For now, it seems like surnames and a world map is the major criteria. I think guidance on tree making, listing surnames and criteria for the inclusion or exclusion of many tangential relatives and relatives through marriages would be a helpful start. Even a sixth cousin with a tiny DNA match does not mean I match the smith in their tree. Thank You for your consideration in finding a better resolution. You’re far from the only one concerned about linkages being suggested that just aren’t so. But in my experience the DNA Circles — and, by extrapolation, these newly expanded circles — draw from a much much smaller pool of DNA matches. I have no Website but I am a genealogist for 40 odd years. It started out with my surname which was Smith….they are legion! My mother’s American ancestry was a challenge with having both New Englanders and Southern ancestors. This was much more exciting than my father’s English ancestors – I mean, how many Smith families can there be…but nonetheless, I actually found a more distant relative who had a proven family tree…bless him! … and he was willing to share. DNA is sure a great tool to have, isn’t it? Was there any mention of when Ancestry expects to be testing in Canada and Australia? “Later this year” is all that was said. Ancestry’s plans for enhanced circles are going to be really interesting in endogamous groups. I have only one circle at present, but I do have several matches with whom I share 3-5 common ancestors and up to 30 common surnames. Acadians = 25% of my paper trail; 90% of my DNA matches. And that’s without people in Canada having easy access to test kits. What I would like is a way to filter them out! Endogamy (intermarriage and pedigree collapse in a population group) always poses challenges — and I don’t see anything remotely resembling a solution in these extended circles. The major problem with the circles is that they are tied to the Ancestry family trees which every serious researcher knows are horribly flawed and filled with copied misinformation. Misspelled names or simply including a middle initial rather than the full name also appear to keep matches from being included in circles. This week I discovered that the little “story” Ancestry has added at the top of one of my circles includes a marriage date of 1783, but my 4th great grandfather’s wife was born in 1778 making her 5 years old when they married. This incorrect date is common in Ancestry trees because many people have added it without bothering to do the math. The marriage date is actually the date of his brother’s marriage. It also lists his name with an additional given name that appears nowhere in historical primary source records, only online unsourced trees. So these stories have nothing to do with the information my tree, they are gleaned from others tree that include this individual. I’m appalled that I have spent years researching my family and now Ancestry has added internet garbage to my DNA pages. There are countless other issues such as that the circles appear and reappear based on any number of factors. I’m sorry to share a large dose of negativity, but the more I discover about the Ancestry Circles, the more unhappy I become with Ancestry in every area. The Circles are only a different way of presenting the shaky leaf hints — with all the problems they have. The agreement between FamilyTreeDNA and FamilySearch still doesn’t appear to have materialized. You certainly appear to be right about that… Wonder what happened… This would have been a nice addition.